Also, I don’t like parallax scrolling. It’s a gimmick, and if there is something to be said, or shown, I’d rather not use gimmicks. Plus, it gives me motion sickness. But about templates… they’re easy to spot, and difficult to digest. They are an unnecessary and unwelcome addition to an ever increasingly standardized and gentrified internet. They feed on the insecurities of clients by offering a sense of safety and comfort that will invariably relegate a new site to the ranks of ordinary and unimpressive, which, aside from being aesthetically offensive, is bad for business. With the ability to harness the power of HTML and CSS, it’s not that complicated to add even the most subtle and nuanced bits of customization to the design of a site while under development. Possessing complete control over web site design is empowering, and preferable to being limited by the precepts of a template. This is even more relevant as access to the web via mobile devices has become increasingly more typical. A site that adapts to varying viewport widths, based on the content of the site itself, is compelling and exceedingly functional. My best clients are those who understand the value of customization, are open to the possibilities, and welcome my suggestions. Inherently visual professions are red meat for me, and that’s especially true when the client is open to a creative approach. This project had both: the client is a philosopher and owns a beauty salon. We opted to develop a static site, using HTML and CSS, so as to maximize creative flexibility. We also installed a WordPress blog to allow the owner to express his creativity via the written word. We used visually exciting images to stimulate the visual senses. This client had recently started offering Great Lengths Hair Extensions in his salon and wanted to attract these clients from his website. In order to set his salon apart from the competition, we started with a WOW visual approach as you can see below on his website. Our entire society is based on beauty so it follows that women are willing to spend more to look their best. Hair extension customers will pay a premium if they think their hairdresser is an expert. But how do you demonstrate expertise on a website? The answer is: by using dramatic visuals and top quality design! Our first task was to develop a brand, something that had not been previously pursued. 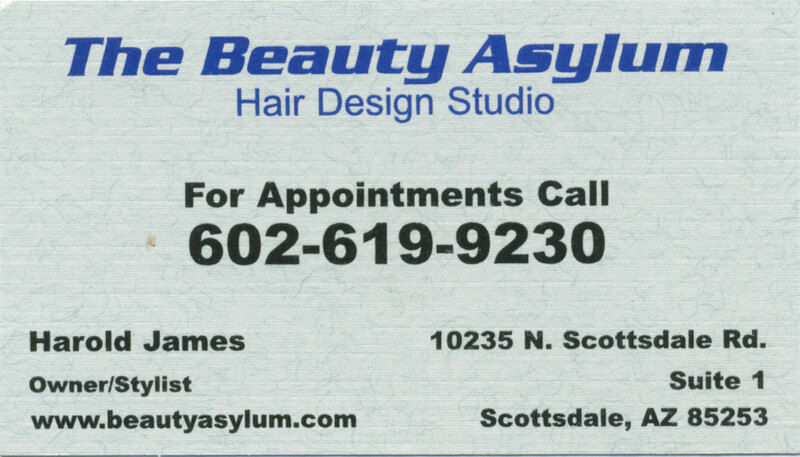 The name of the salon, The Beauty Asylum, served to fuel a concept that was undisciplined and edgy. We designed a typographic approach combining two disparate fonts to create a simple two-letter mark and one mark utilizing the full salon name. The owner developed his tagline which works well with the name of the beauty salon: Insanely Creative Hair Design. The scope of the site was limited and the content concise, so I decided to infuse visual impact with large images as backgrounds. I also wanted to have a unique image on each page in order to demonstrate the diversity of beauty. This feat was easily accomplished by incorporating on-page CSS defining a different background on each page. Content was placed in translucent, roughed edge containers to allow the background image to peek through. The background was also set to a fixed position. This accommodated the use of jpeg’s as opposed to png format images because there was no need to account for the potential of revealing the bottom of the background image. The jpeg’s would be of smaller file size and load quickly. Translucent floating containers were placed on either side of the main content allowing for omnipresent access to the most important pages. Because the salon industry is focused on achieving the pinnacle of beauty, using extremely attractive women in the visual images was the goal of this project. Stimulating the visual senses by giving a sense of beautiful, flowing hair provided an implied meaning that the target client would achieve beauty by hiring this salon. Attract better quality beauty salon clients * Get a new brand and website! 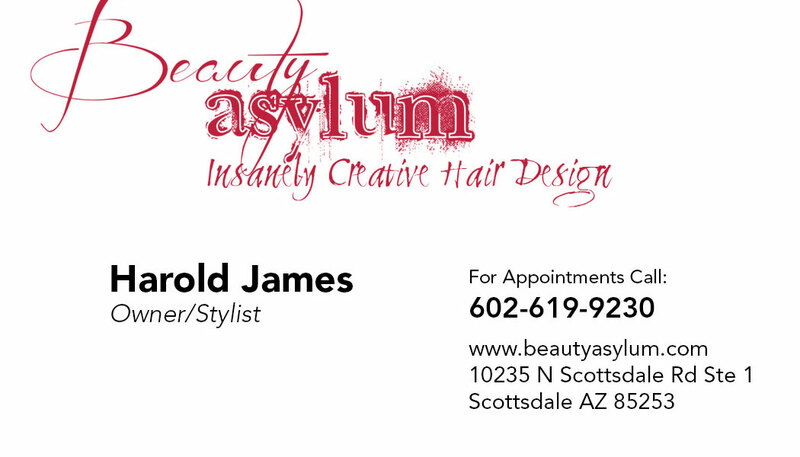 Contact me today to request a consultation for your salon website re-design! We used photos of Harold, the owner, for use on the “About Us” page. A single head shot was used above the fold while I compiled a photo montage to place below the content. This was done to develop an emotional connection between the website visitor and the hair salon owner. Very often salon websites fail to showcase the stylists and/or owners’ personality through use of visuals. Developing a connection prior to actually meeting the stylist can increase the likelihood of the customer making the hiring decision. The use of an image where the owner is smiling with an approachable facial expression increases engagement. The montage served to show the owner “in action” while smiling and giving the appearance of personality and charm. The owner wrote his own home page content with our direction with the purpose of demonstrating his expertise. All too often beauty salons focus on their own characteristics rather than what the client is seeking: clients want to look their best. Explaining why this salon has the capability to provide expert hair cutting, hair extension application, and color correction was the goal. The content provided by the owner was then optimized for the search engines. On-page SEO was utilized in this project to give the owner placement in the organic search results. The beauty industry is very competitive, so the use of authentic SEO can provide a significant benefit by bringing traffic naturally rather than via paid search results. 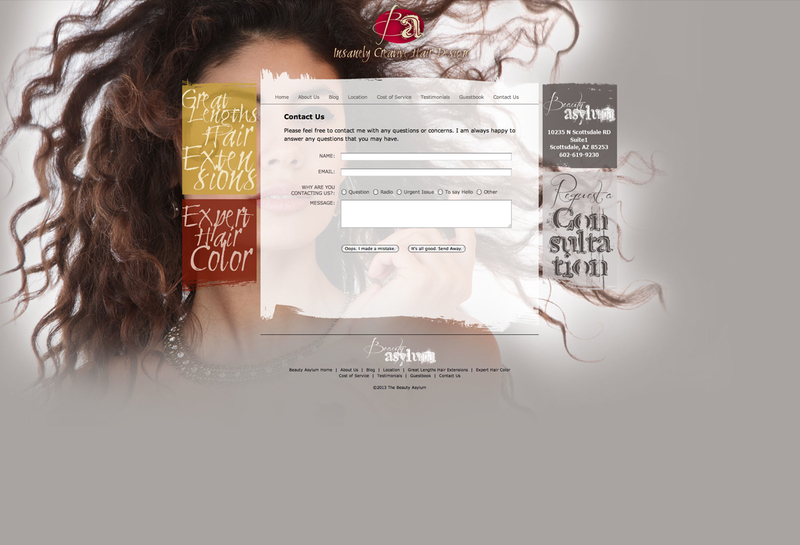 Use of this menu style served to encourage the visitor to click on specific pages such as “hair extensions” and “expert hair color.” The “request a consultation” was also utilized to drive the visitor to book an appointment and make a purchasing decision. 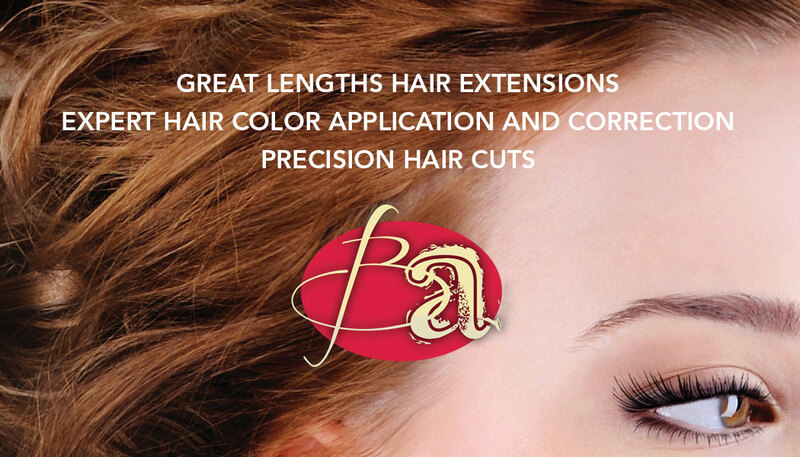 The “before and after” visual slider showcases the owner’s expertise in color application, color correction, hair extensions in an attractive medium. The blog served two purposes the first being a creative outlet for the owner to express his opinions, reviews, and guidance. The second purpose was to bring search engine traffic. In this day and age, static websites without fresh content generally don’t get the benefit of the search engines gods. The blog is hosted ON the domain rather than an exterior site. 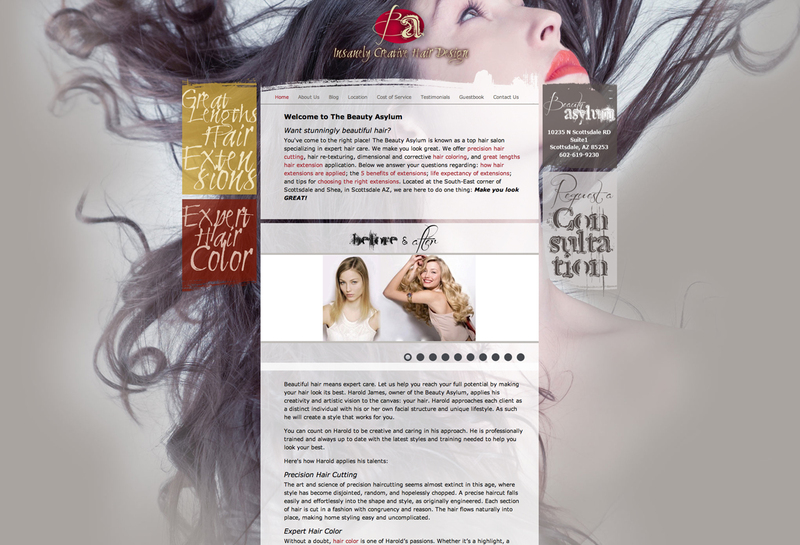 The beauty industry naturally allows for creative expression in website design and branding. Our culture is focused on beauty, looking our best, and being “gorgeous” in the eyes of the public. There’s absolutely no reason why a beauty salon owner shouldn’t budget for a stunning website that is a sound business investment. This project proves the point. 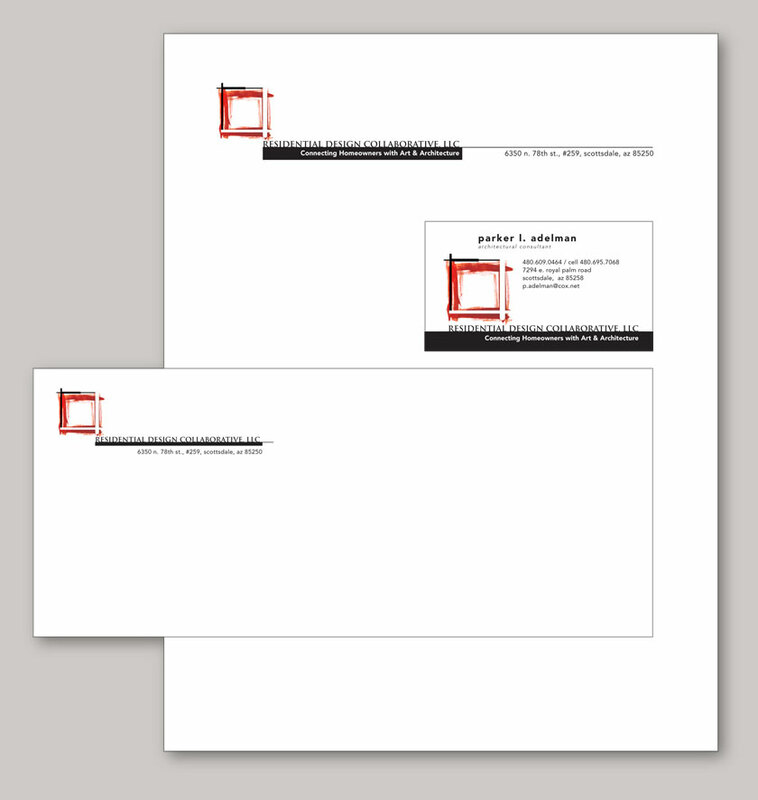 Update: See the Business Card re-design for this client and notice the difference between the before and after card design. 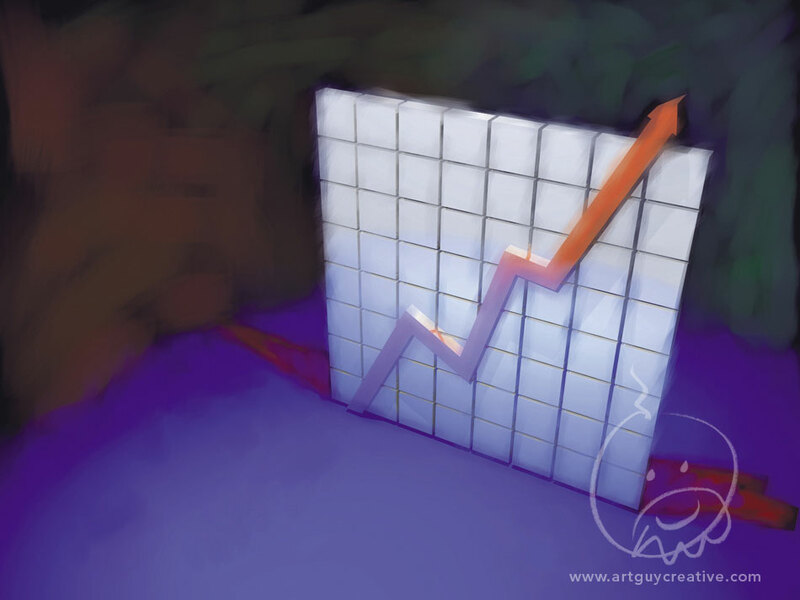 Update: This client has seen a significant increase in revenue after the re-design of their website. They are finding that their customers are pre-sold when they come in for a consultation. They are receiving referrals from other beauty professionals who recognize the stylist from his website (people the stylist does not even know). Investing in branding and website design for your beauty salon can pay off in many ways. With a visually stunning website, your salon will be considered an industry leader among your peers AND you’ll be reaping the financial rewards of a major increase in business revenue. A companies mark can be sacred, and for good reason. It is the heart of the companies brand identity, and represents everything the company believes in and stands for, and is indelibly branded on a every product and service it offers. The style guide for a mark has a biblical importance, addressing every possible variation of use in promoting strict consistency. But… in our brave new all-things-digital world, consistency is an opportunity lost. An image on a website can be altered instantly, unlike once-dominant print marketing. So we have come to expect unceasing change in our daily interactions with the world to nurture and appease our ever shrinking attention spans. I assert that infusing variations into a mark has advantages for making and keeping connections to a marketplace that expects mutation and transformation. A client was recently very open to the possibilities. In developing his new mark, I uncovered a desire on his part to correspond with his clients on a more personal level. We discussed the practicalities of utilizing the mark for the purpose. Birth stones had always intrigued him, and his fascination fit in well with the overall concept of honing and refining. Branding is an essential component of any successful firm yet creating a compelling visual brand can be a challenge. What does branding mean? It is simply a way to visually create a distinction that shows your position in the market place. Suffice to say, it is a way to demonstrate value and mission. How does one determine which way to go? If your homepage is designed around you it will have a completely different “look” than if it is designed around your company. The visuals will focus on your headshot or other image that portrays you in the design. Prospective clients landing on your page will perceive your firm as you because the design is focused on you. Celebrity – are you well known in your community? If you’re visible in the community, out and about frequently, and recognizable, then it makes sense to brand YOU. Public speaking – if you frequently give presentations, seminars, and workshops and the pubic is accustomed to seeing you present, then it makes sense to brand YOU. Media attention – if the media frequently contacts you for quotes on matters related to your profession and you are the “go to” person in your community, featured on magazine covers and recognized at award ceremonies, it makes sense to brand your company around YOU. More than one professional – if you are not the only professional in your company, then it makes sense to brand your firm rather than you. Target market – if you have a distinct target market you would like to attract, then focusing on you may not guide potential clients to a hiring decision. Instead, focusing your brand on the needs of your ideal clients can be very powerful. Team approach – if you prefer that clients contact your staff when they have needs, branding your company takes the focus off you. Rather than having your time monopolized, delegating to staff frees you up to do other things. Visual design expressed through your brand helps your firm to differentiate itself from the many professionals competing for business in your geographic area. If you’re not sure how to approach the design and branding of your firm, contact us. We offer a Complimentary Consultation to help you determine your options. Each brand has a personality that permeates the company’s very existence like the example above. This architect wanted to design outside the box and it shows up in his brand. This is an example of a well-designed brand that matches the company’s personality. Every five to ten years a company can undergo changes that require a rebranding and repositioning of the firm’s brand personality. People change. Companies change. It follows that the brand changes too. If your company is going through a change in its persona, it’s important to figure out your new company personality in order to prevent mistakes. To learn more about branding, read my series on branding questions that clients often ask. How have your values changed over the years? Are you more altruistic? More professional? More experienced? How have your clients changed? Are they more affluent or less affluent? Are your recent clients more experienced than in the past? Are you seeking higher net worth clients? Have you brought on new hires or staff that have caused a personality change? Do you want to go in a new direction? Once you get a handle on the changes your company has experienced, you’ll have a better idea of which direction you’d like to take to avoid brand mistakes. What types of brand personalities are there in the design world? I’ve seen many examples of brand mistakes where the brand does not match a company’s personality. For example, I was once called in to design an invitation series for a law firm. Their brand was old, stodgy, and staid. I expected to shake the hand of a 60’s partner after walking through the front door. What I experienced instead was a young, hip professional with a biting sense of humor and a motorcycle to boot. So I ended up designing a very cool invitation that matched the company brand and it was a big hit that signaled a new direction for the firm. The most common brand personality mistake I’ve seen is when a company’s brand personality is mismatched because it’s just poorly designed. In other words, the brand was not professionally developed, and it showed. As I’ve said over and over again, investing in your brand is worth it because it presents your business in a positive light. Your brand helps you land the affluent client. Your brand helps you stand apart from the competition. Your brand is your vision. Very few people realize the work, expertise, and time that goes into designing a brand. Be willing to make the investment and avoid brand personality mistakes. Some time ago we completed a beauty salon website re-design for an owner who specializes in great lengths hair extensions and hair color correction. His brand before the website redesign was non-descript and lacked visual excitement. 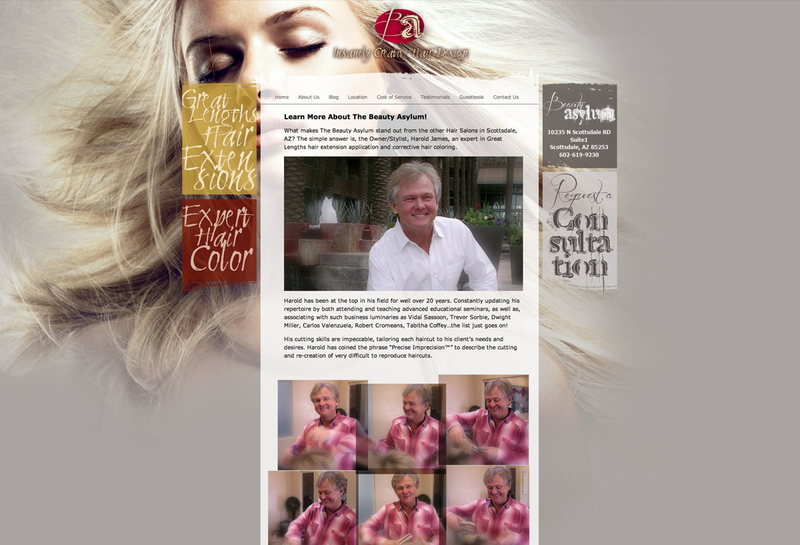 You can see from his hair extension beauty salon website re-design that it positions him as an expert in his field and creates a visual WOW moment upon landing on the site. Recently he asked us to redesign his business card. You’ll see below that we have transformed his card from a straight forward, non-visual card into a stunning piece that he can be proud to hand out. This post illustrates the point of maintaining brand continuity. Once you have completed a re-branding, all your marketing materials should be updated to maintain consistency across all your marketing channels. Your brochure, your business card, and any other marketing collateral. Of note: this client now delights in an additional $2,000.00 to $3,000.00 per month in income from his new site, due to search engine optimization and exciting, high quality design. He has received several clients recently who told him they were referred by other hair professionals who were familiar with his services. What’s interesting is that the owner does not know ANY of the people who recommended him. It’s likely that they found his website and were impressed by his brand and therefore endorsed him. Back to the business card. Would you be excited to visit this salon? Would you view the owner as an expert in his field? Would you be willing to spend hundreds or thousands of dollars in this establishment? 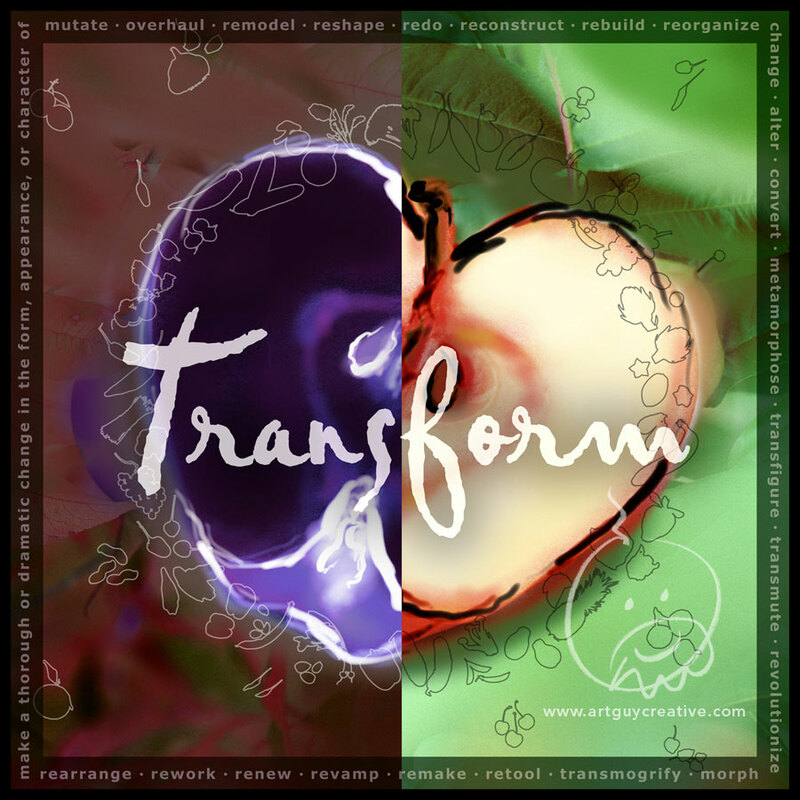 Note that the re-designed card includes a juxtaposition of design. The front is devoid of color except in the business name with a hint of red. The back of the card is a visual delight and a surprise with the image of a beautiful woman and a listing of the main, high-end services. Would you be excited to hire this expert? Would you be more inclined to hire this person over one from the first business card? I would venture a guess and say YES! The subtle effects of expert design are both conscious and subconscious. We know immediately when we walk into a home that is upscale and expensive. The furnishings are impressive. The art is beautiful. The same applies with branding and website design. Impress your visitors. Create visual excitement. Position your firm as the best choice by creating optical branding that implies expertise. The word “brand” means many things to many people. These days it’s a buzzword bandied about as if it were the “it” word of the 21st century. The problem is, no one really knows what branding means. It’s my goal to clear up the mystifying concepts behind branding with my blog post series Branding Questions, which seeks to explain effective web design and branding. Broken down to its most simplistic value it means a mark or symbol used to exemplify a firm’s very essence. In simple English, a brand is what your firm believes in. But the term applies to many components of your business. It’s not just a logo. When clients come to me they usually say “I want you to design a brand for my new company” and I say “OK. What do you stand for?” To which I hear silence. Considering that your brand is capable of giving you a major competitive advantage, it’s important to understand how you arrive at figuring out your brand. What are your firm values? For whom are you meant to perform your mission? If you were making decisions about your strategic direction, how would your brand come into play? How will all this translate to your website and online branding? Make a list of what makes you different from your competitors. Think of WHY someone would hire you over any other company. Then add the answers from above. This should help you come up with what your brand stands for and what it really offers. 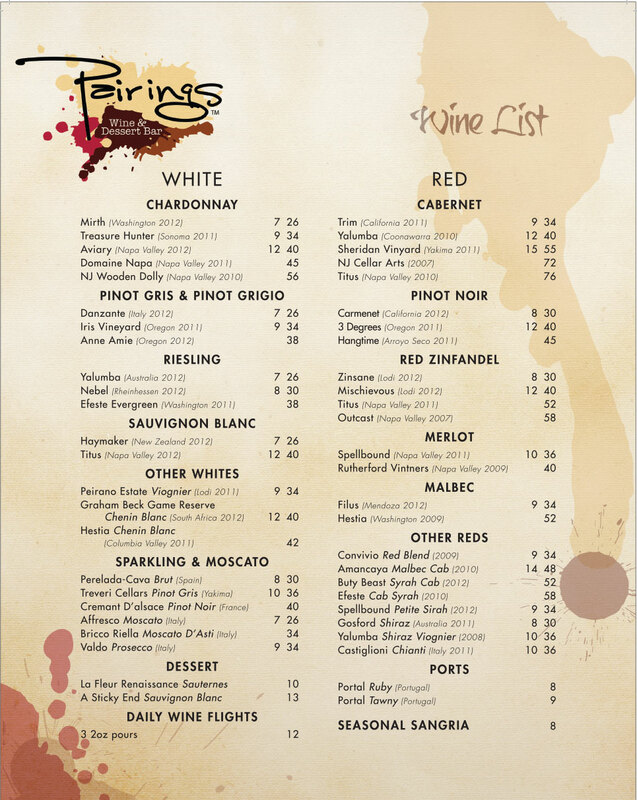 We have just completed a series of menus for a client in the mid-west who requested an artistic brand for his new wine bar concept. As a wine lover, I was excited to work on this project as wine is one of my passions. I enjoy a fine Chardonnay that is “oaky” and “buttery” yet I am also open to reds of bold flavors and colors. Wine provides a unique design opportunity due to the color, hue, and style of many wines. Wine bottles, corks, openers, glasses, and other elements add to the romanticism and make for a beautiful design. This project included the name concept and branding. 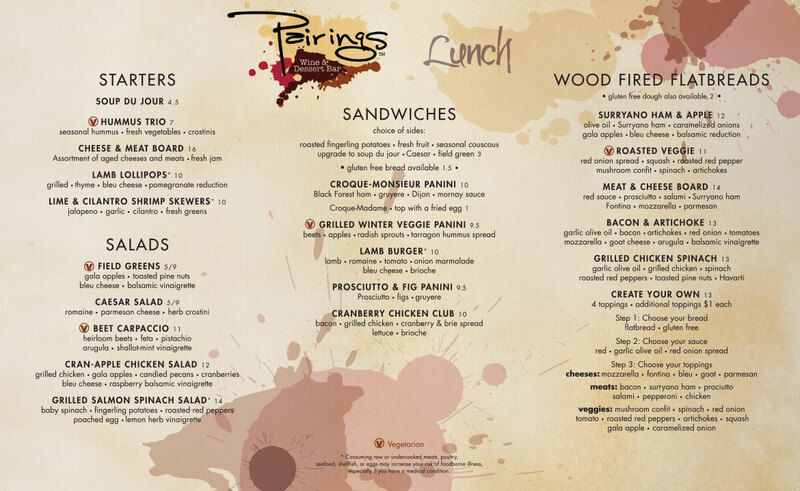 The menus are extensive and include lunch, dinner, happy hour, wine, and dessert. 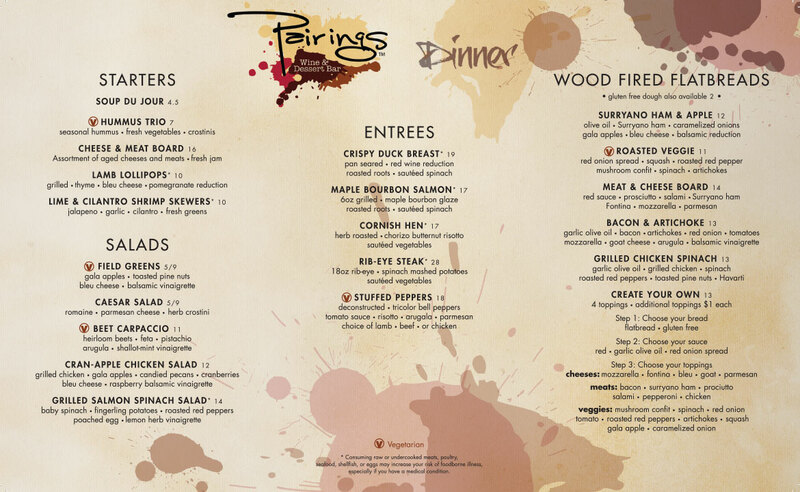 Notice the “ink-blot” style stains on the menus and you’ll see that they are actually spilled wine that has been incorporated into the design. 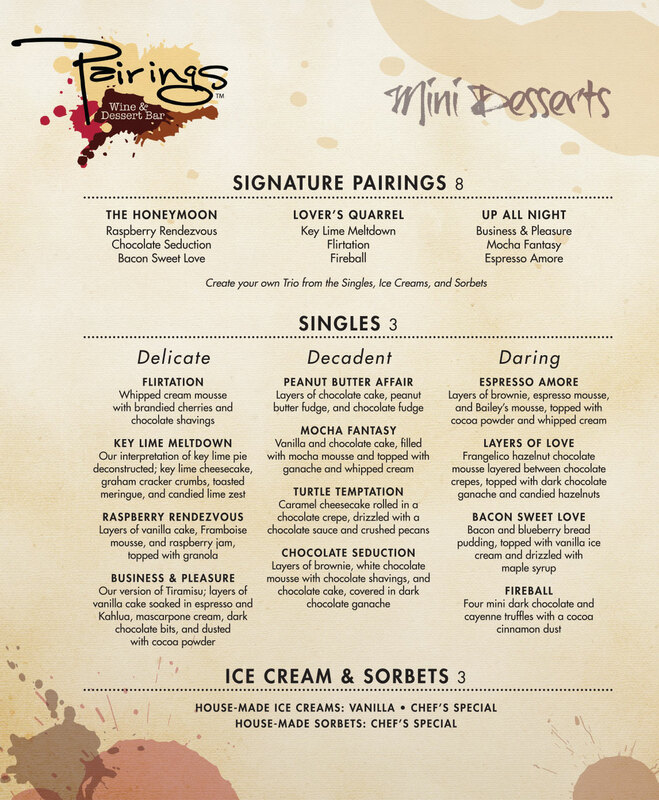 The name concept came into being because the owner’s desire was to pair wine with dessert. Is an online brand different than a brand of years past? Have we witnessed a new age in which branding has evolved into pixels, one’s, and zeros? This post is part of my Branding Questions Series designed to answer your frequently asked questions about branding. It used to be that a company would disseminate its brand through traditional marketing channels and collateral such as print brochures, business cards, billboards and the like. Business owners in years past would meet for the first time and hand out their print collateral. Or prospective clients would request a firm’s brochure to be mailed to them. This was usually the first introduction to a business brand. In the Internet age, a website is the new brand channel and it’s the way to leverage brand your business online. So it follows that having a creative, well designed and branded website is crucial to your online success. But what factors are important in branding your online business? It’s difficult to know what elements are necessary in the website project planning phase. Review this checklist with a detailed list of good branding elements for your website. Many of the same print design elements carry over to online branding such as color scheme, font choice, values, tagline, strategy, blogging, and social media integration. Color scheme – there are pleasing color combinations and there are horrendous color choices. What’s right for you? Your company personality comes out in your choice of website colors so approach your color scheme carefully. Cutting edge companies go with cutting edge colors. Traditional companies stick with traditional colors. If you are seeking a competitive advantage, sticking with “safe” colors is probably not the way to go. Font – in years past we were limited to standard fonts like helvetica, arial, and verdana because these were the fonts installed on most website browsers resulting in all websites having a similar look. Today, font choice has greatly improved which can help you position your company as different from the competition. 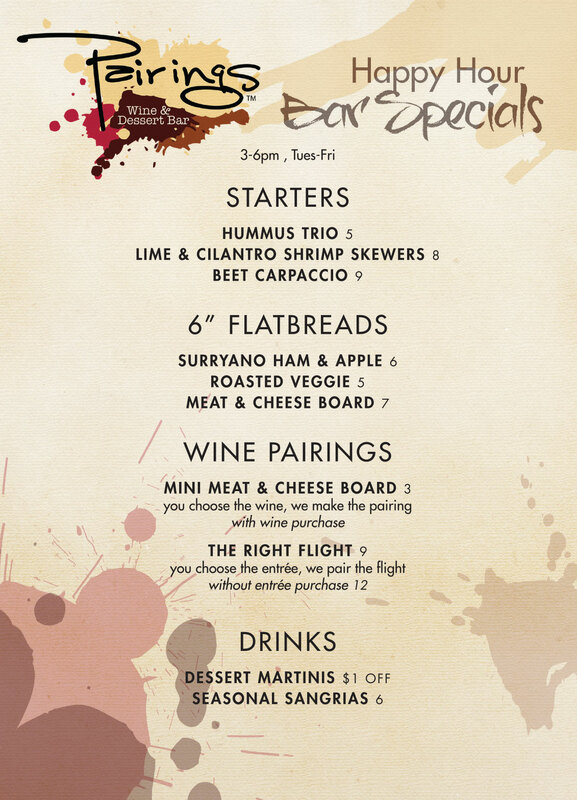 A more elegant font sets the tone and can appeal to a quality client base. Values – what do you stand for? What’s important to your business? Let visitors know through your website content and use your values to attract an ideal clientele. When your values are in line with the clients you want to work with, magic happens. Tagline – coming up with a good tagline for your website is a great way to leverage your online personality. Here’s a helpful tagline worksheet to get you started. Strategy – show how you are different from your competitors by being very clear in your value proposition. This can be as simple as stating 5 reasons to work with our company and lining them up 1. 2. 3. Etc. This calls attention to the best aspects of your firm, something we quite frequently forget to do. Blogging – what better way to build brand personality than with a blog? Studies show that companies that blog receive 97% more leads than those who don’t. Blogging as a lead generation strategy is not simple, but it is necessary for businesses to understand and incorporate into their websites. Social media integration – rather than adding social media as a post design element, plan to use social media icons and links to profiles in your online brand right at the beginning of your project. This is a huge part of online branding because your social media profiles can be used to tell your story, feature case studies, and build relationships. Your ideal clients can interact with you on social media and get to know you before they hire you. Conclusion: So yes, branding has evolved. A business website is the new medium for a good first impression. Communication online is anonymous. The website visitor can learn about your company at their leisure. They can interact with you via your online brand and social media. The key is having all the successful elements work in your favor. 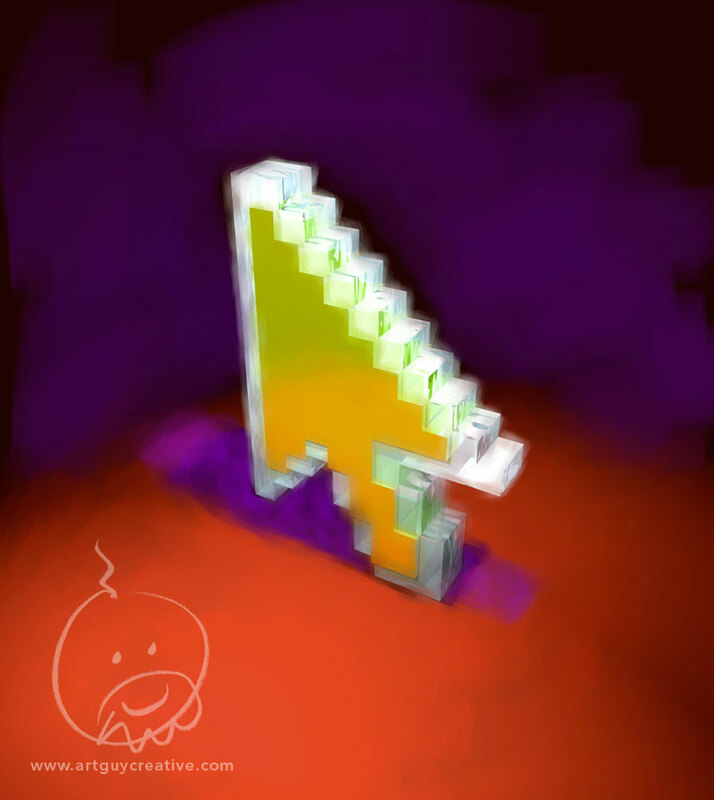 You don’t need any old website. You need a beautifully designed website. You need a website that is on PAGE ONE of the search results. No one is going to search for your services by typing in your company name unless they already know you. You need to be on page one for the search phrases that prospective clients use to find you. If you are not on page one, you don’t get traffic. It’s as simple as that. AND if your site is not well designed, visitors will leave quickly. You have to make an impression on prospective clients with the quality of your website design. Clients don’t use any old search phrases. They want specific services. They want to know that you have worked with people in their situation who have the same challenges they have. How do you figure out which search terms to use? Only an experienced, thoughtful consultant can determine the search terms visitors use to find you. The more expensive your product or service, the more important it is to invest in quality design and branding. Web visitors will subconsciously make a value judgment about your business by the aesthetics of your website design. When I take on a new website client, I perform a thorough intake process that goes in depth into how people search and how that can best benefit your business. This means your website will help to grow your business and get new clients even when you are sleeping. Imagine getting clients from your website who are already pre-sold on your services – ready to sign on the dotted line. Now that is a sound investment! How long does it take to get business from your website? When a new website goes live it takes from six to twelve months for the search engines to “index” the content and feature the site in their search results, although you may receive benefit from your new site right away just from the quality of the site design. What design elements increase your site results? Exciting visuals showing your prospective clients enjoying their lifestyle after they have hired you. Call to action (above the fold) telling visitors what you want them to do next – beautifully designed, not just words in a box. Social proof – use of testimonials discussing the wonderful results your clients have achieved (or for financial advisors, case studies). Content focused on your ideal clients, their challenges, and your solutions. You can obtain quality clients from your website if the project is thoughtfully organized by an experienced web developer. This article is part of a series of blog posts that provide answers to your most frequently asked branding and design questions. Take a look to learn more.